25. Boscoreale now Pompeii, Villa rustica nel Fondo di Antonio Prisco. Excavated February to July 1903 by cav. Carlo Rossi-Filangieri. Covered in again after the excavations. In Civita-Giuliana, Boscoreale (today Pompei). Near the villa a tomb was also found. North of Pompeii Porta Vesuvio, slightly north-west of the Villa of T. Siminius Stephanus. The Villa together with the other two buildings previously discovered in the nearby fondo Barbatelli (Notizie degli Scavi,1899-1901) and fondo D’Aquino (Notizie degli Scavi, 1897-98) were closely related, and not only for immediate continuity but to give rise to the spontaneous hypothesis that all three buildings arose in antiquity, with their façades onto a single public roadway, that which came out from Pompeii through the Porta Vesuvio, forming the continuation of Via Stabiana. Notizie degli Scavi di Antichità, 1921, pp. 415ff. Carrington, R., 1931. Studies in the Campanian Villae Rusticae: Journal of Roman Studies, 21, pp.121 (n.25 and note10, 116 and note 3. Casale A., Bianco A., Primo contributo alla topografia del suburbio pompeiano: Supplemento al n. 15 di ANTIQUA ottobre-dicembre 1979, 26, p. 35, fig. 10. Crova, B., 1942. Edilizia e tecnica rurale di Roma antica, Milano, pp. 59ff. Day, J., 1932. Agriculture in the life of Pompeii: Yale Classical Studies, 3, Tav. A, C, n.25. Elia O., 1975. La scultura pompeiana in tufo: Cronache Pompeiane I, p. 121, p. 132, fig. 8-9. Fabbricotti, E., 1976. I bagni nelle prime ville romane: Cronache Pompeiane, II, pp. 41ff, fig. 9. Garcia y Garcia L., 2017. Scavi Privati nel Territorio di Pompei. Roma: Arbor Sapientiae, no. 45, pp. 300-309. Rostovzev, M., 1973. Storia economica e sociale dell'Impero romano, Firenze, 5° ediz., p. 34, note 26. n. 25. Stefani G., 2000. La Villa del fondo Prisco in località Cività in Casali di ieri Casali di oggi - Architetture rurali e tecniche agricole nel territorio di Pompei e Stabiae, Mostra 2000. pp. 45-48. Stefani, G., 1998. Pompei oltre la vita: Nuove testimonianze dalle necropoli. SAP Exhibition Catalogue, p. 106-8. Villa del fondo Prisco, Pompei, according to SAP website. Modesta fattoria con adiacente monumento funerario. Dotata di torcularium per il vino, presentava anche un piccolo settore termale con mosaico pavimentale, alcuni cubicoli ed un triclinio. Ricoperta dopo lo scavo. Small farm with adjacent funerary monument. Equipped with torcularium for wine, also had a small bath area with floor mosaic, some bedrooms and a triclinium. Villa rustica in contrada Civita Giuliana, fig.9, era una modesta villa, costruita in opus incertum con ovvi restauri dopo I danni arrecati dal terremoto del 62 d.c; in tali opere, però, è affatto assente il materiale laterizio. Ha andamento curvilinea nel fronte occidentale, per accordarlo con la via pubblica: dalla via e dalla campagna si accedeva per due ingressi A e A1. Villa rustica in contrada Civita Giuliana, fig. 9, it was a modest villa, built in opus incertum with obvious repairs after the damage caused by the earthquake of 62 A.D; In such works, however, there is no brick material at all. It curved at the western front, following the public roadway: it was entered by two entrances A, on the west from the road and A1 on the east from the countryside. See Fabbricotti, E., I bagni nelle prime ville romane: Cronache Pompeiane II, 1976, pp.41-43, fig.9. “Ten years ago, by commission expressly from sig. Sopraintendente prof. Vittorio Spinazzola, I had to prepare an extensive report, accompanied by numerous photographs, plans and drawings on eleven private excavations of which no news had been given yet. But now that every investigation to find it has been in vain, so it must be considered as definitively lost, and now the Sopraintendenza considers that gap must be filled, not without pain, I have redone the work already completed and with this and other subsequent reports, I will give news of the precious topographical antiquarian material, unearthed in the excavations”. See Notizie degli Scavi, 1921, p.416 villa I.
Villa rustica, explored by sig. Carlo Rossi-Filangieri in the fondo of Antonio Prisco, in contrada Civita-Giuliana (Comune di Boscoreale), during the months of February to July of the year 1903. Pompeii. Villa Rustica nel fondo di Antonio Prisco. 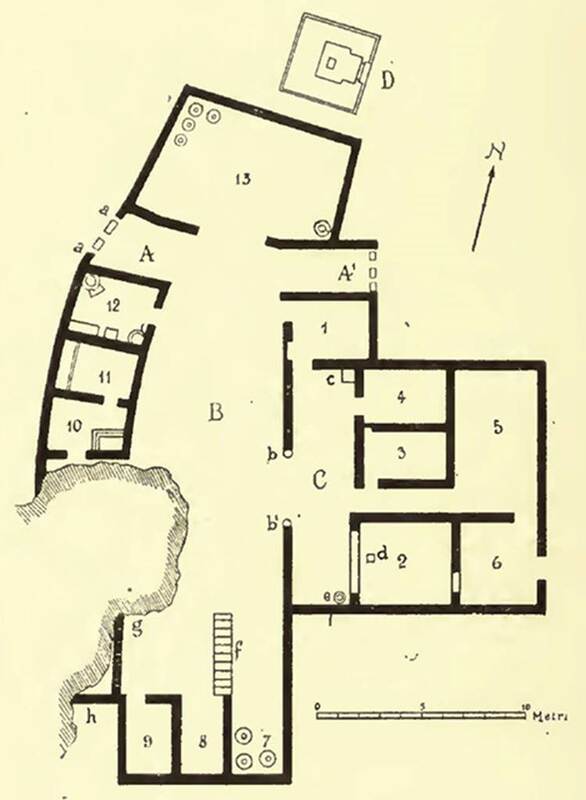 Plan of villa and tomb “D”. See Notizie degli Scavi di Antichità, 1921, p. 416, fig. 1. See Casale A., Bianco A., Primo contributo alla topografia del suburbio pompeiano: Supplemento al n. 15 di ANTIQUA ottobre-dicembre 1979, CB26 (Fig.10). The Villa rustica, together with the other two buildings previously discovered in the nearby fondo Barbatelli (Notizie degli Scavi,1899-1901) and fondo D’Aquino (Notizie degli Scavi, 1897-98) were closely related, and not only for immediate continuity but to give rise to the spontaneous hypothesis that all three buildings arose in antiquity, with their façades onto a single public roadway, that which came out from Pompeii through the porta Vesuvius, forming the continuation of Via Stabiana. The hypothesis, at least with regard to this third building, had the character of certainty: a look at the topographic survey (fig. 1), shows that by providing the building with the curve of an already existing public roadway, it would have determined the curve of the western front side; no less significant was the other fact that on the roadway was an adjoining burial monument “D” with its front façade decorated with two portrait busts and marble slab, on which however the funeral title had not yet been incised. The modest rustic villa, built in opus incertum the usual Pompeian materials, offered the obvious restorations and reconstructions with which the damage from the earthquake of the year 63 was repaired: in these works, however, the brick material was entirely absent. From the street and from the countryside, one entered into the villa respectively by two doorways A and A', each which closed with two wooden shutters, mounted above thresholds of Vesuvian stone: of these entrances, the one onto the roadway which was the most noble, (A) bore on its side pillars, "a and a" two large ornamental sphinxes in tufa of Nocera, covered with white stucco, solid, 0.90m high, from the woman’s head to the half-unfolded and multiple breasts, resting on its hind legs, erect on the front. 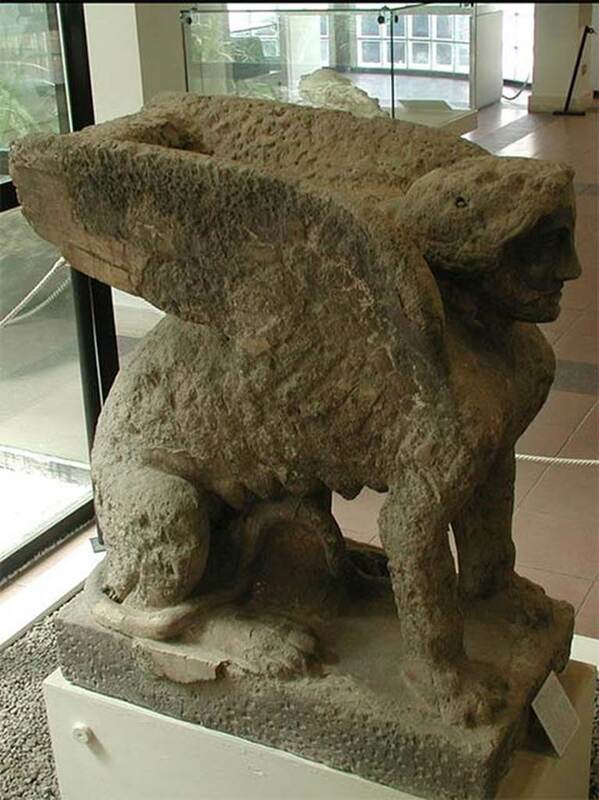 Of the two sphinxes the one, today in Pompeii, was able to be entirely reassembled; only the head was collected of the other. Bronze: Two pivot hinge plates, a conical boiler, a pastry former with cut-off cone and elliptical base. Pompeii, Villa rustica nel Fondo di Antonio Prisco. Entrance A side pillar. 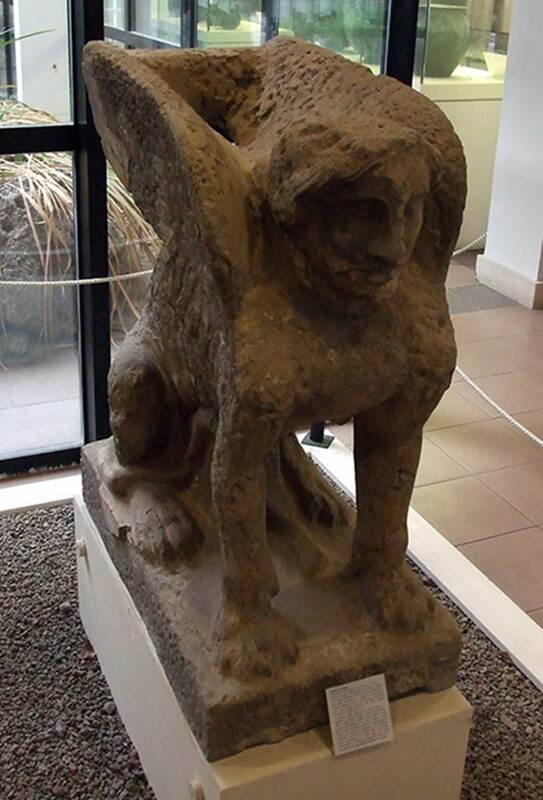 Statue of a seated sphinx with feline body, female head and large wings. Possibly dated to 2nd century BC. 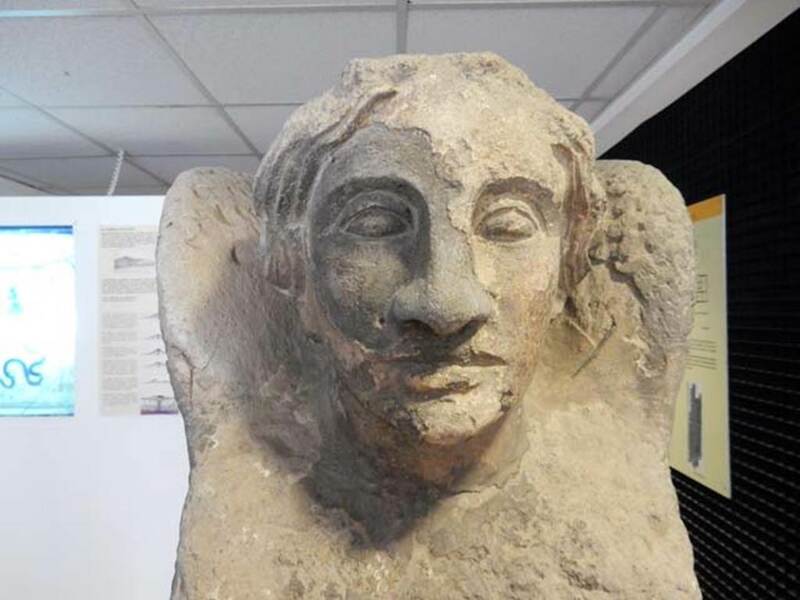 It would have originally been a funeral monument but by 79AD it had been placed, with another similar one (of which only the head was found), at the entrance to the villa. Now in Boscoreale Antiquarium. SAP inventory number 25896. The statue was found out of its original funerary context, so we cannot be certain that it was attributable to this tomb “D”. The floor was of simple beaten earth. Vestibule “C” was protected by a simple roof and had a floor of beaten earth, and opened onto the courtyard “B” by a spacious entrance doorway, lacking any closure, and bordered by two Doric columns formed from tufa of Nocera, “b and b’”, 4.50m high and covered with brick plaster up until the height of 1.55m. Pompeii, Villa rustica nel Fondo di Antonio Prisco. Column “b’ ”. Graffito discussing quantities of garden posts. Now in SAP deposits. SAP inventory number 20518. With this you would have wanted to check the work already accomplished, at a given moment, DCCCXL =840 posts, and what still remained to be done, CDLX =460 posts, by a slave attached to the vineyard: the work entrusted to him was to sharpen the lower extremities of a sum total of MCCC=1300 posts. (note 1: by Della Corte: Most of the epigraphic material provenanced from the private excavations was already included in vol. IV of CIL, however I limit myself to present it in italics: I present for the first time only the inscriptions destined for vol. X of the same Corpus). At "c" was a large masonry pedestal that was used to support the first step to a wooden staircase, in direction N-S, to the upper floor. The purpose of the main vestibule described was to accommodate and store undercover a vehicle probably a plaustrum, of which were found here many remains such as parts of iron, and some laminated bronze decorative items, perhaps pertinent to horse tack. The rustic area “room 1” must be considered as the cella ostiaria, because of its position. From its western wall was obtained a cupboard, divided into three compartments thanks to the many wooden boxes embedded in the walls of the chest. then found on the ground was a whole collection of nine pipes, made of cylindrical segments of bone, with interior and exterior coating of bronze plate, with all the holes and some of the articulated small bridges of the keys, preserved. Pompeii, Villa rustica nel Fondo di Antonio Prisco. Room 1. Now in Naples Archaeological Museum. Inventory number 129589. In bronze: fragmented mirror, with a series of little holes along the periphery; a casserole 0.17m in diameter; a conical boiler, 0.15m wide to the edge. In marble: a female head, 0.14m high. In lead: two small weights. The torcularium (press), “room 2", was all open onto the vestibule, and had its walls and the floor covered in plaster of well-smoothed cocciopesto, and stretched over a large basin. In "d" was the square opening to contain the wooden column, which supported and articulated the tignum or horizontal crushing beam; in "e", a large dolium was sunk into the ground into which flowed, by the sensibly tilted floor, the juice extracted from the crushed grapes. The first cubiculum, "3", was found after a corridor. 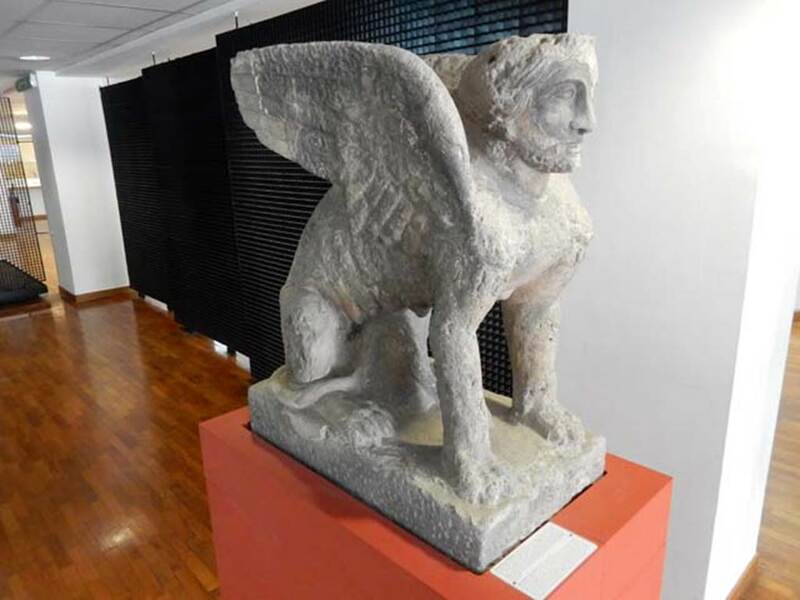 It had a cocciopesto floor and white walls divided in panels thanks to simple yellow bands: in the centre of the panels was a mask, or a sphinx with man’s head or some other winged monster, monochrome yellow, of careless execution. In addition to the remains of the door and lock, were found here a glass flask, 0.10m high; a lead weight of rectangular plan, 0.06 m high; a clay lamp with a relief of Diana Lucifera; a bronze cooking pot, 0.20m high; a white marble pillar with spiral, internally holed, 0.60 m high, perhaps originally intended to support the basin of a fountain; three bulging oil-jugs 0.27m high of rustic terracotta, and a bowl 0.17 m in diameter. a perfume bottle/jar 0.11m high; two lead plumb-lines with chisel tip; an amphora 0.22m high; a pitcher 0.19m high, and a rustic terracotta cooking pot 0.13m high. At the rear of the described cubicula was the triclinium “room 5”, with a uniform white background above a black zoccolo: the floor here was also of cocciopesto. Along the north wall was located one of three items of furniture, of which here was stamped in the ash the impression of the wood with its linear ivory inlays: leaning against the west wall, and evidenced also from the impression observed in the layer of ash was a wooden cupboard. Many terracotta pots were found gathered here, but all in fragments, except for a rustic oil-jug, 0.25m high. The successive “room 6” was found with rustic walls, with entrance doorway to the east in direct communication with the countryside, and with window in the opposite wall, projecting onto the torcularium (“room 2”). Many objects were unearthed here (see NdS 1921, pages 419-420). In bronze: an ovoidal situla (bucket) with iron handle, 0.40m high; a lebete (cauldron) of 0.26m in diameter, with the handles designated in heads of serpents; a plate 0.20m wide with handle terminating in ram’s head; a potbellied oil or ointment jar 0.19m high; two oinochoai (wine jugs) 0.14m and 0.16m high whose handles were respectively decorated with a leaf and a mask; a conical boiler 0.16m high; another, lenticular, 0.35m wide, with bridged handle. In glass: three large square bottles 0.27-29m high with ribbon handles; three more of the same shape 0.18m high; three small cubic jars 0.16m high; a cup of 0.15m diameter, and two cylindrical bodied phials. In ivory: fragments of small wheels and of straps ornamenting perhaps a saddle. In iron: a craticular (grill) 0.60 m long, of seven rods. and finally, a large elliptical vase, tall m. 0.57m high, diam. max. 0.37m, whose cavity was divided into two by a vertical partition, and whose outer rim was furnished with four ear handles. Read on a wine amphora found here, was the inscription M. F.; CIL IV 5725. Pompeii, Villa rustica nel Fondo di Antonio Prisco. Marble table. See Notizie degli Scavi di Antichità, 1921, p. 418, fig. 2. But a find of more importance was a beautiful marble table. The marble top of the table 0.75 x0.47m, in “fior di persico” (a rich marble, mottled with red and white) was supported by a monopodium 0.92m high, rising from a simply formed base. The monopodium was decorated by a herm, at the top of which was a bearded Hermes with a head in “rosso antico” (maroon red marble from Greece), the feet of “giallo antico” (yellow marble from Numidia) and the trunk of “marmo africano”(dark, generally black, marble from Turkey). An adjacent stairway “f” led to the upper floor above this short side of the building. The corner formed by the sections of wall "g" and "h", only in part excavated, bordered a cella vinaria; this was certain by the vents/slits which crossed the wall "g", at 1 .20 m above the ground, vents that assisted the current of air onto the dolia placed there. A private bath suite completed the western side of the modest Villa. It consisted of a frigidarium (“room 10”) with cocciopesto floor and walls coated with rustic brick plaster, in which the bath was obtained by the elevation, from the floor by two external walls reinforced by steps, and covered with marble slabs. The calidarium (“room 11”) was linked with it. The plaster of the calidarium was painted a uniform deep green, masking the underneath exposed cavity obtained with the use of the usual tegulae mammatae; and whose floor, with white and black mosaic, was set on small brick pillars (suspensurae); a white background covered the area covered with a barrel vault, running in an east-west direction, in the resulting tympanum in the walls two windows opened, one circular closed with glass which gave the only light; the other rectangular furnished with a moveable frame of wood, that could have been able to give light but was evidently intended to temper the heat produced in the room, by being able to open it only when needed. The alveus (bath), entered by climbing over the simple masonry parapet, received hot and cold water from two lead pipes that led to the boiler and the reservoir of the adjacent praefurnium. Pompeii, Villa rustica nel Fondo di Antonio Prisco. Room 11. Calidarium. 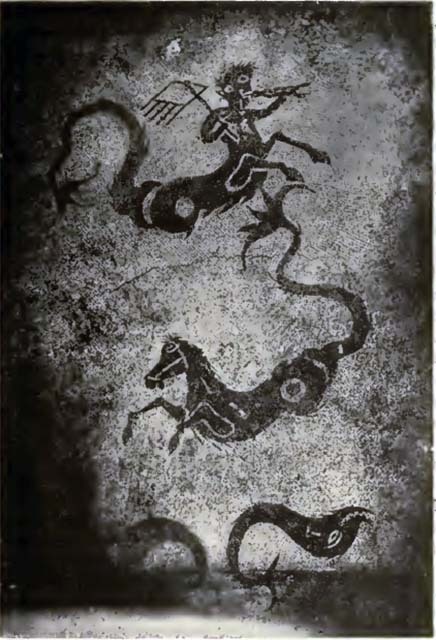 Black and white mosaic floor with sea centaur, sea horse and two dolphins. See Notizie degli Scavi di Antichità, 1921, p. 419, fig. 3. According to Fabbricotti, these are a marine centaur, marine bull and two fishes. See Fabbricotti E., 1976. Cronache Pompeiane II, pp. 43-44. The praefurnium-kitchen, "room 12", with walls entirely rustic, and a floor of simple beaten earth, contained, along the south wall, the furnace to heat the water, the podium of the kitchen, and a small Vesuvian stone manual mill; in the north-west corner, was a hearth, of modest proportions. Found here were two elliptical weights of lead; two bronze handles, belonging perhaps to a chest, and a casserole of 0.15 m in diameter. Only one room, "room 13", opened on to the courtyard “B” from the north side, and was an area covered simply by a roof, and with the floor of beaten earth. Found here in fragments were five dolia; and then a bronze pot-bellied vase 0.15m high; two bone hinges; a bronze ovoidal situla (bucket) 0.22m high; a spherical boiler, 0.30m wide; two terracotta wine amphorae both with the inscription CIL IV 6408 on the neck, and a third with the inscription CIL IV 5875: Pompo(ni) Fau(stini). It was under this roof, located towards the entrance and clear of upper floor construction that would have collapsed relatively quickly, that the miserable inhabitants of the Villa were reduced to search for an escape from their extreme fate: their six skeletons, including a child and also the skeletons of two dogs, were found in the middle of this area buried here by the collapse of the roof. 1) some parts of columns of tufa of Nocera, 0.40m in diameter, covered in well cared for white stucco, above one of which two epigraphic graffiti could be read: CIL IV 6884 and 6885. 2) some fragments of painted stucco, which when recomposed, formed a fresco of 0.50 x 0.60m, edged with a red band, and at the bottom, strewn with pine leaves. Shown there, in prospect, was the bust of a young Satyr, crowned with pine, supporting on the left shoulder, the young Bacchus, naked, crowned with vine leaves, and drinking the contents of a hemispherical cup, raised on high with a bunch of grapes in his right hand. A crown of leaves and fruits of medlar finished the representation. The solid and elegant tomb “D” was, most likely, a dependence of the described Villa rustica, it measured 3,30m at the side, and 5.45m high, all covered with white stucco and carefully made, worked with big raised ashlars in the top half, while the lower half, protruding and slightly pyramidal, was smooth: a rich cornice bordered the upper ashlar at the point where, rising, the masonry formed a tholos. In the face turned towards the west, just below the terminal cornice, a large slab of white marble of 1m x 0.65m was embedded in the wall. Unfortunately, it was without inscription, ready perhaps to receive the engraving of a new title to replace an older one, a fragment of which perhaps was that engraved on a slab of marble of 0.06m thick, in letters 0.05m high of neglected execution which came from inside the tomb. Fragment of engraving from a marble slab found inside the tomb. See Notizie degli Scavi di Antichità, 1921, p. 422. See Stefani, G., 1998. Pompei oltre la vita: Nuove testimonianze dalle necropoli. SAP Exhibition Catalogue, p. 106-8. Pompeii, Villa rustica nel Fondo di Antonio Prisco. Tomb “D”. 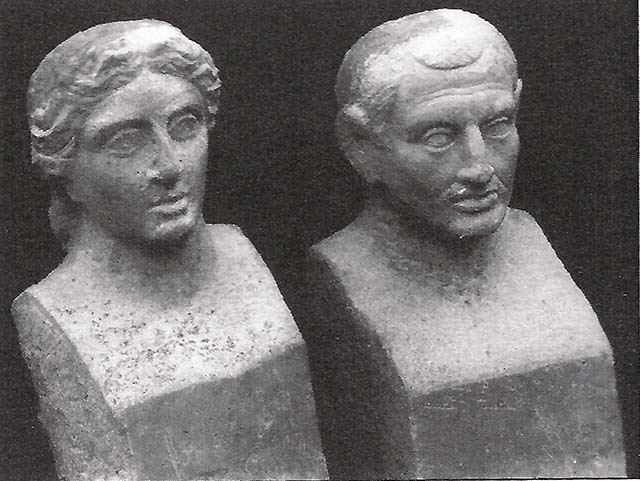 Two travertine portraits busts found in a semi-circular niche below the marble plaque on the west side of the tomb. See Notizie degli Scavi di Antichità, 1921, p. 422, fig. 4. If the funeral title tablet had been recovered, we would have known who was portrayed in the two travertine busts, found in a special semi-circular niche 0.90m high; opened just below the mentioned marble slab. The two interesting portraits depict certainly the resemblance of the couple who provided for the erection of the monument; but, having to be exposed rather high up, the busts were not finished but here and there they were only sketched: the trunks were shaped as herms: 0.73m high. In the east wall, 1.50 m above the ground, was the door, monolithic, of Vesuvian stone, mounted between threshold, architrave and door-jambs equally monolithic and of the same stone, 0.80 m high. The door-jambs being slightly inclined at the top, the door, which opened from the outside in, appeared pyramidal externally. The interior of the tomb, a columbarium (a place for the respectful storage of cinerary urns) all covered with white stucco, consisted of two floors, the higher at the height of the threshold of the door, the lower, about 2 m underneath the first, and accessible by a central hatch of 0.70 m at the side. In the upper floor, in each corner was embedded a terracotta pot over a small masonry pedestal; at the same level a channel was open along the walls; in the western wall two circular openings, opened above the mentioned channel, communicating with the exterior; in the opposite eastern and western walls are two semi-circular niches, 0.60 m high. The lower floor was a columbarium of thirty-two niches, presenting eight semi-circular niches on each wall, arranged in two superimposed orders. Of the pots, and the remains they held, only a few fragments were found, because the columbarium had already been disturbed a long time ago, from searchers who penetrated from the tholos, which was probably not fully covered over by the 79AD eruption, demolishing the solid masonry. See Stefani G., 1998. Pompei oltre la vita: Nuove testimonianze dalle necropoli, p. 106-8. See Della Corte M., Notizie degli Scavi di Antichità, 1921, p. 416, fig. 4.